The hooked-fish, can be pretty much fun and be played during boring time. In office, home, and school, whenever people feel bored and easily take out to play with. The fun fish has two set: one is hook and another one is basically fish. 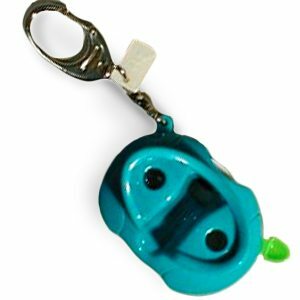 On the fish’s mouth, there is a circle made to have fun with hook. People also can put the fish into water, and moving fishing makes more fun to people. Considering the function of fun and easily put into pocket, so fun fish is an ideal gift to give your friends as a complement or functional toy to enhance their home or work environment. This is a toy that I can define as fun and entertaining, not only physically but mentally as well. This brain teaser is rich in varied knowledge of symbolic logic. This puzzle toy was well-known and rare in the 19th century in Europe and America, as a benefit of intelligence. This toy challenges the body and mind, keeping you entertained in the moment and opening your mind for the future. The design of the puzzle is quite simple in its shape and form, but overall it looks a little difficult. The product does not come with a solution to the puzzle, you have to figure it out for yourself. Basically, the objective is to detach the metal wires from one another. The concept of the toy is very easy to understand but actually making it happen is quite complex. This toy is suitable for a wide audience ranging from children to adults. The toy I choose is the Newton’s cradle. It consists of 5 metal spheres of the same size and weight hanging alinged on the frame. It is shiny and sleek, but I find most people are attracted to it because of its well known behaviour of transmittion of motion between the spheres. Almost everyone knows how to operate it (lift one sphere up then releasing it and expect the one on the other end to go up), but no one seems to know the reason behind it. this toy practice the law of conservation of momentum and energy. many people misunderstood it to be perpetual motion, when in fact it is not, because the collision between spheres aren’t totally elastic and there are energy lost as forms of heat (friction) and sound. 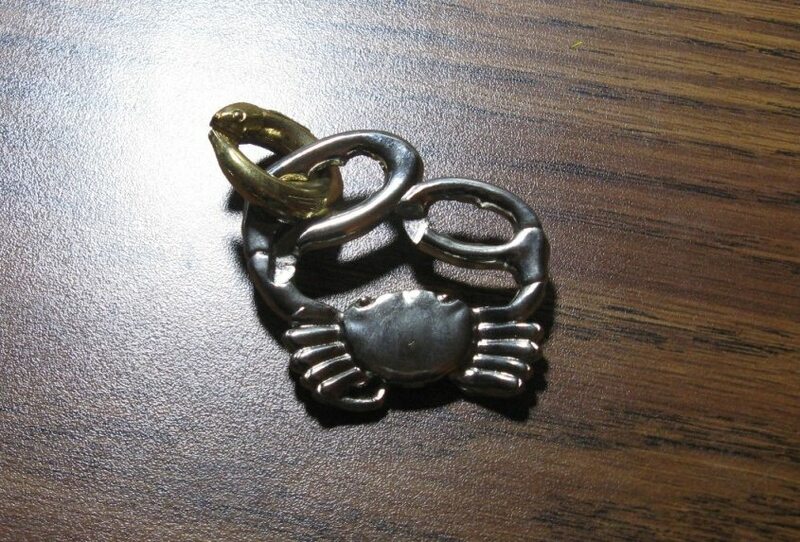 The toy I chose for this exercise is Cast Puzzle Cast Crab. It’s a mind teaser puzzle where the main objective (for this one specifically) is to liberate the Golden Fish from the Silver Crabs’ claws. The object of the puzzle is very simple to understand, but it is not easy to accomplish. This game requires strong concentration and focus from the subject, and they must use their mental knowledge to properly win the game. Because of these requirements, the game keeps you focused on the task at hand without killing any brains cells (rather, it strengthens them) and keeps you interested. The design for this mind teaser in particular is also attractively appealing and made of materials that function well with the design. This game was given to me by my father from one of his work visits to Japan. My toy was the mini keychain ViewMaster. 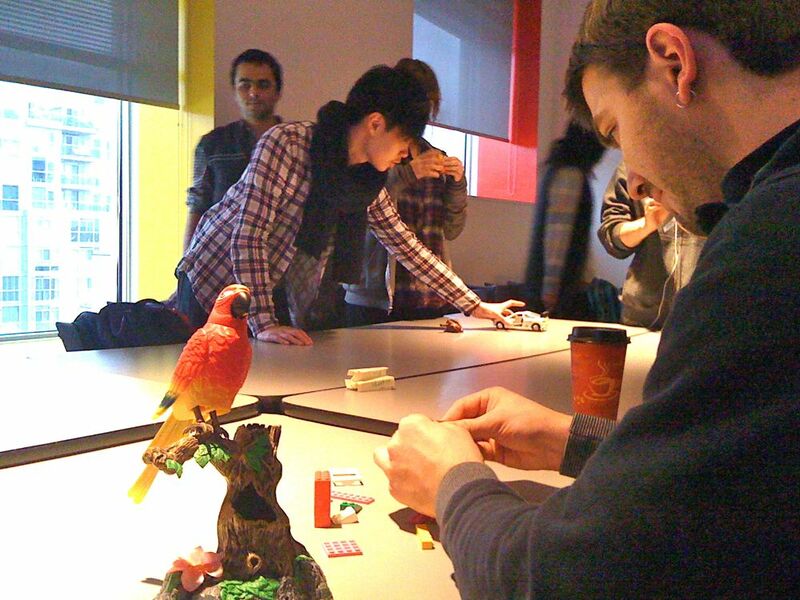 People seemed intrigued by the tiny toy and what it could do. The turquoise colour grabs people’s attention. A lot of people picked it up and instantly started using it. Others were trying to figure out how it worked because it’s so small. It can be hard sometimes to look through the eyeholes. 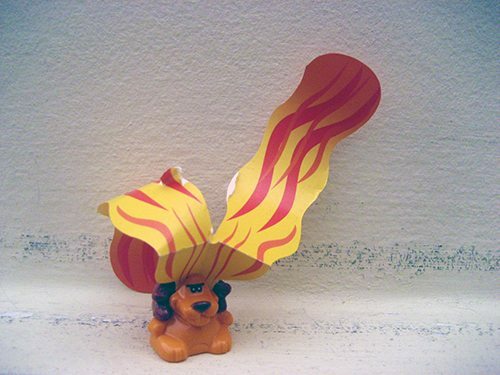 This is a MIY [make it yourself] toy from a Kindersurprise. The toy is a doggy with paper wings that flies like a football, in a spiral and lands neatly (theoretically) on the ground. The toy itself is colourful and visually attractive. Furthermore, the toy is mentally challenging because you have to assemble it together. Mind you, mentally challenging can vary in degrees. And finally, the toy is very physically stimulating. Not only because of the building aspect of the toy, but also the way you play with it – throwing. The toy promots a physical interation. The toy I brought to class was a wooden frog instrument, basically it could serve as a decorative piece, a toy, and an instrument. 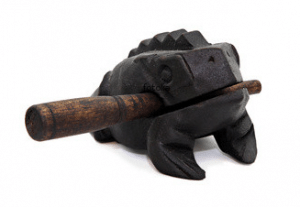 How it works is you can remove the wooden stick from its mouth and when rubbed against its back it makes the sound that resembles a frog. I noticed that many people were confused about how to use it and needed explanation on how to play with it. The frog is fun because it is engaging and it gives feedback of sound. People keep rotating different layers of the cube when they are playing with it. Some people found it challenging and some people think it is easy to solve. There are solutions to solving the cube from absolutely any legal position. 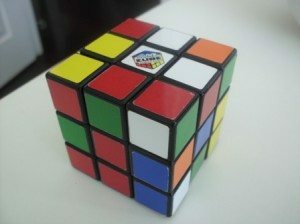 But, when people don’t know the solutions to solve the cube, they tend to give up in a few seconds and leave the cube alone. My toy “Jenga” is a set of building blocks. Its supper fun!!! It tests both of your physical and your mental flexibility. When users are playing with this toy, their concentrations are deadly focused on the toy. They have to think of what they are doing now and predict what they are going to do later in order to build the tallest tower possible. The target audience of this toy ranges from age 5 to as old as you can get and they can have all kinds of career. 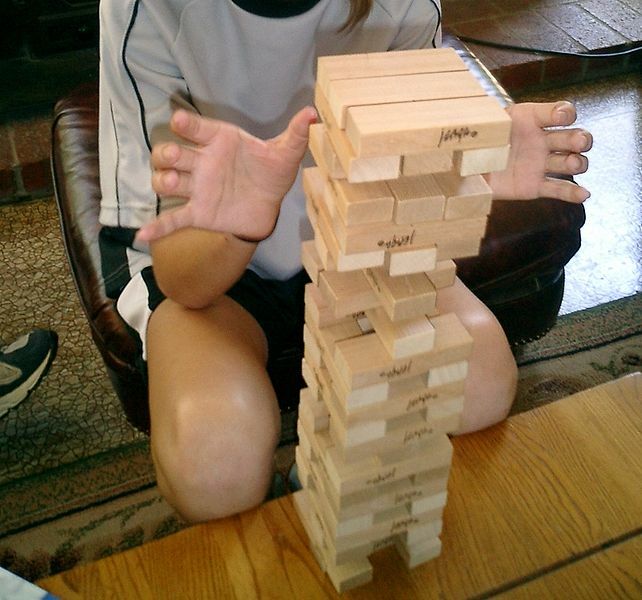 This large target market proved Jenga’s success. Exercise Six, Part Two: What is Fun? Initially subjects would attempt to twist the lid off (probably believing that it screwed on like plastic bottle caps). Often inadvertently they would pop it off as it was designed to, the unanticipated force throwing the plastic monkeys into their face and other undesirable places. Subjects would then begin hooking monkeys (either intuitively or from familiarity with the toy) though they would often skip the first step, hooking monkeys straight out of the barrel, or ask what the objective was. After hooking a few monkeys, they would either resign in explicit frustration or attempt to disturb the remaining monkeys in a manner that would make them easier to hook. 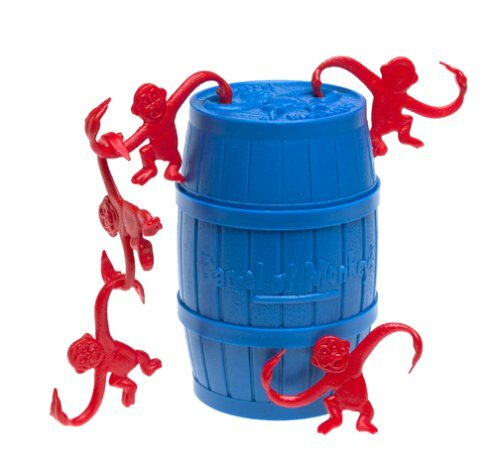 If the unchained monkeys were still in the barrel, attempts to jostle them would involve tilting, shaking, or bashing the barrel against the table. Subjects would often drag a chain against the table to pull up monkeys flat against the table. Despite expressions of frustration, subjects were transfixed by the challenge; several testified that the toy is the coolest ever and that they could spend hours playing with it. Challenge and competition are major contributions to the fun quality of Barrel of Monkeys. Appealing colours and open ended states certainly don’t hurt. The clearest problem is communicating to the user how to open the barrel appropriately and use the monkeys in the most satisfying manner. The toy’s endurance, distinction, and franchise confer with the success of the design. Exercise Six: Deconstruct a Toy — What is Fun? Please bring, beg, borrow or steal (OK, don’t steal) one or more toy from home or elsewhere to class next week. Our definition of a toy is as yet undetermined, so feel free to challenge our preconceived notions. The only restriction is that the toy not be something that you already have in your bag (i.e. not your cell phone). Exercise Six, Part One is due at 15:30 on Friday, February 11. Take detailed descriptive notes of what you observe. Where possible, capture your partner’s views of their experience in their own words. Clearly separate description from interpretation. Include in your notes your own thoughts, feelings and related experiences — these are also field data. 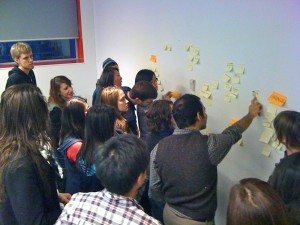 Analyse your field observations by distilling them into a series of answers to today’s fundamental question: “What is Fun?” Record these answers on the sticky notes provided. Collectively we will use these sticky notes to interpret the structure of fun. Exercise Six, Part Two is due in class on Friday, February 12. Post an image of your toy to the blog. Post the transcript of your field observations, edited for grammar and clarity but not content. I will post an image of our collective interpretation to the blog. Exercise Six, Part Two is due at 15:30 on Monday, February 14. You are currently browsing the archives for the 2.6 – Exercise Six category. © 2019 GDES1B26 — FW2010 — 19.